The second pattern in the Elements Sock Collection, a series of sock designs based on the Classical Elements, is dedicated to the element of Fire. 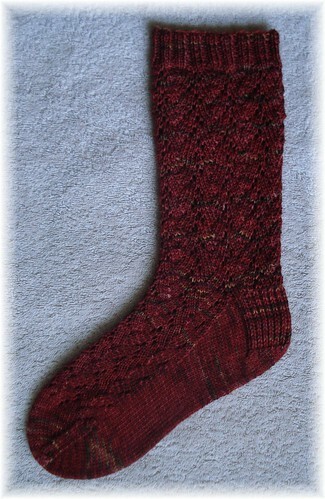 Once again, this pattern consists of two sock designs based on a single element. These are top down designs with stitch patterns in both charted and written out form. 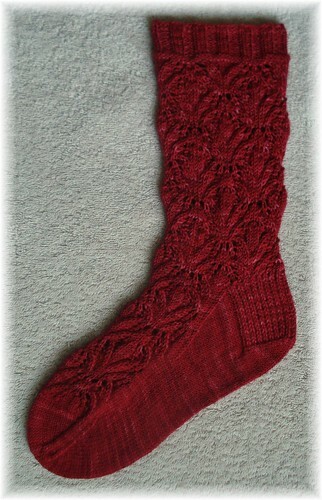 The first design, Lava Flow, is an easily memorized design - perfect for sock knitting on the go. Inspired by the fire from the core of the Earth, the stitches meander back and forth in much the same way lava flows out of the earth and across the land. This simple stitch pattern has a repetition and flow that works well in both solid and multicolored sock yarns without losing it's impact. Shown in Fleece Artist Merino 2/6 in the Burgundy colorway. Knit on US 1(2.25mm) needles at a gauge of 8 stitches per inch in stockinette. Fireside uses a more complex stitch pattern to give the feeling of campfires and fireside gatherings. Throughout history, humans have gathered around a fire for warmth, safety, cooking, and to socialize. Whether the fire is a communal one in a primitive village, a campfire in the woods where marshmallows are roasted, or in a fireplace on a cold, winter's evening, enjoyed with loved ones and a mug of hot cocoa, fire is an important part of any society and evokes strong emotional responses. While not as easily memorized as Lava Flow, the richly textured stitch pattern for Fireside is still easy to work and the rhythm of the stitches make this design fun to knit. This design is best worked in a solid or almost solid yarn. Shown in Fleece Artist Merino 2/6 in the Ruby Red colorway. Knit on US 0 (2 mm) needles at a gauge of 9 stitches per inch in stockinette. It's a stunningly beautiful pattern! Well designed and well done! Love the patterns, and had to have them. ::gushing:: LOVE both patterns! Especially the Fireside :-) Will this be available forever, or for a limited time only? I don't have any patterns that are "Limited Time Only" patterns. At this point, all the patterns I have will be available for as long as I keep selling patterns. I'm not saying I'll never do a limited run on a pattern, I just haven't done it yet. Great question!